Hello from the month of May! It seems I blinked and April had come and gone. When I looked up, May was here, and with it came open windows, bright green leaves on all of the trees, honeysuckle scented air, baby sheep & cows in all the pastures, and strawberries in my garden. I love strawberries because they seem to usher in the warmer seasons. The actual first taste of the bounty to come. There’s just something so good about that. It makes me happy. The recipe I’m sharing with you today is definitely a grown up dessert. 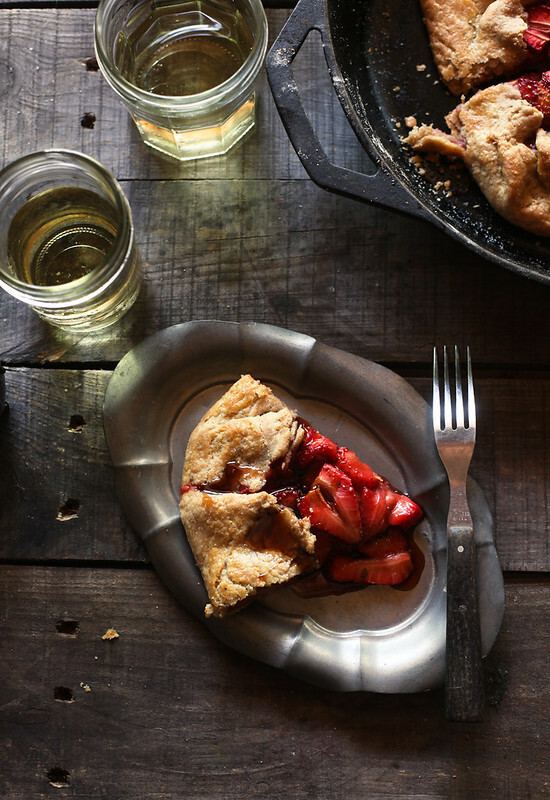 It’s a little something different than your run of the mill sweet strawberry pie. I macerated strawberries in a balsamic and honey mix, baked it up in a whole wheat crust & topped it off with some freshly ground pepper. It’s hearty, a little bit tart, and really tasty. 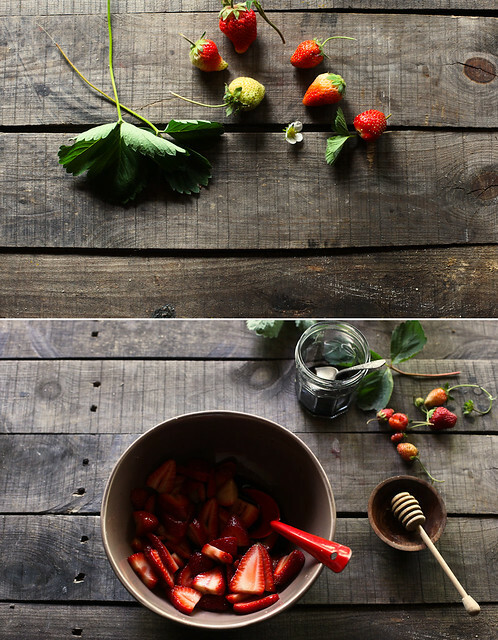 Slice strawberries, toss in bowl with balsamic vinegar & honey. Let sit for 1 hour or more, up to 24 hours. Preheat oven to 375. Roll out dough to 1/8 inch thick. Lay crust flat on cookie sheet or cast iron pan. Strain strawberries, reserving the liquid. Combine the flour, sugar and almond flour, and sprinkle around the center of the dough, leaving 2 inch border. Mound strawberries on top of the dough, then fold dough over, overlapping where necessary. Brush dough with egg. Bake until golden brown & bubbling, about 45 minutes. Meanwhile, place remaining balsamic & honey in a small saucepan, adding 2 more tablespoons of balsamic and 3 more tablespoons of honey, boil until thickened. Remove galette from oven & top with freshly ground pepper. Serve warm with balsamic honey sauce. 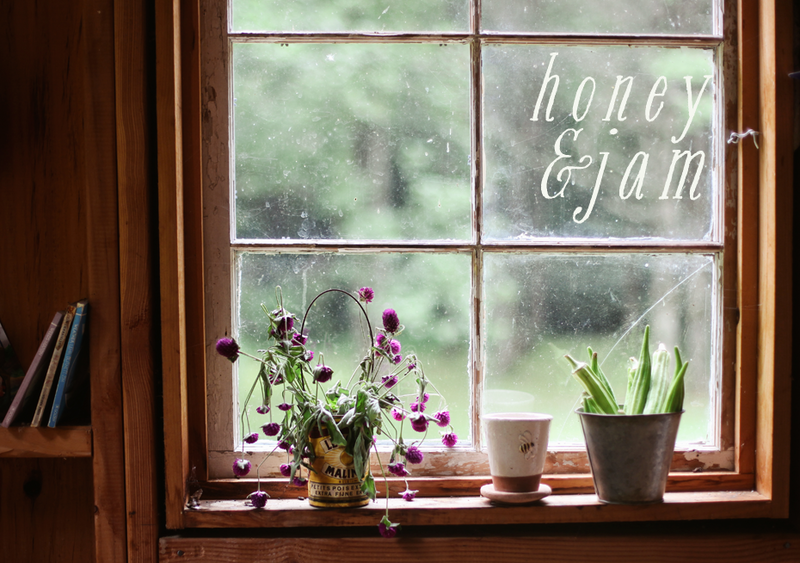 PS, check out my feature on Oh Joy! What is the coincidence of that? lol. those berries are just gorgeous. I've got some strawberries that are itching to jump into this galette. Thanks! Stunning! Thanks for sharing such a beautiful recipe. Now I just need to find some delicious strawberries. Beautiful shots! 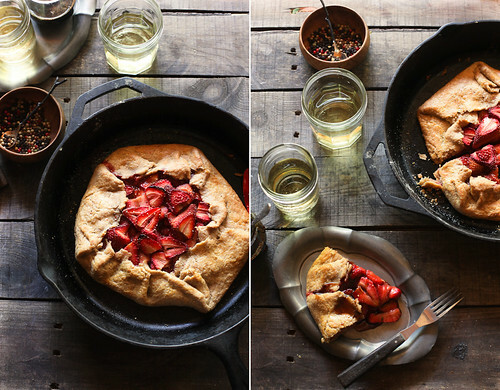 I really like the idea of a whole wheat crust paired with balsamic and strawberries. Beautiful tart. 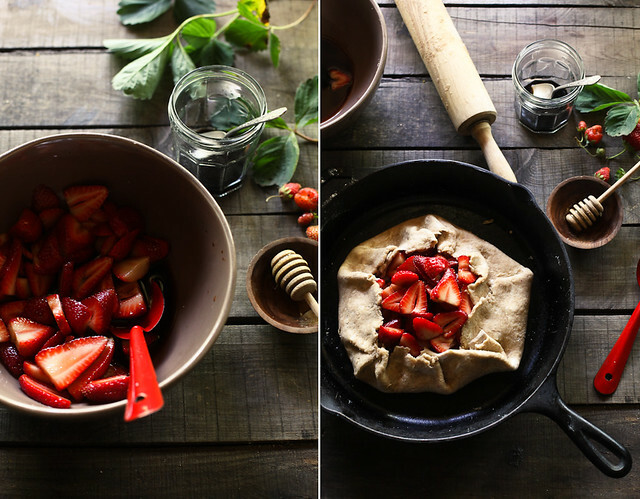 Strawberries, pepper and balsamic vinegar is a killer combo. I put it in biscuits once. Major. I imagine it all in a tart to be stellar. Pictures are gorgeous, per usual. So incredibly beautiful! Bookmarking this--must. make. soon! 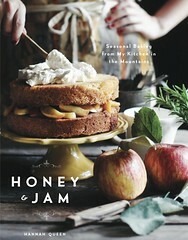 There is absolutely no way that I am not making this this weekend! Oh, I love this galette, love the flavors. Pinned and shared on FB. My fav part about this recipe would be the combo of balsamic vinegar with strawberries and then freshly ground pepper on top ... brilliant! That looks so good! I love the addition of balsamic vinegar. this looks absoloutely delish. thanks for sharing. I just wanted to let you know I linked your inspiring galette to my own little post of my galette! I love your taste and its so inspiring! wow what a recipe! 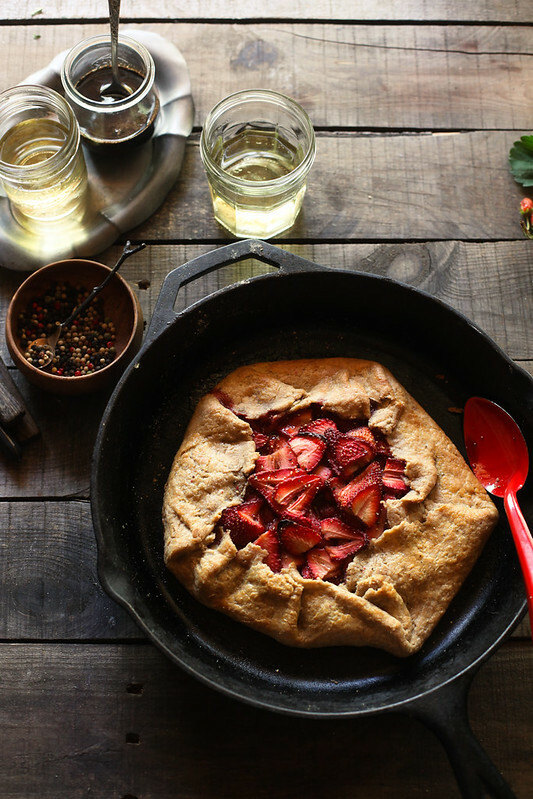 Definitely going to bake this Honey Balsamic Strawberry Galette on the weekend. Love your blog it's gorgeous. check out my blog for some creative food inspiration. Strawberries in your garden?! HELLO awesomeness! This galette sounds so yummy. I love it! Homegrown strawberries and a Galette...life is good!! Love that background board, lovely clicks. Mmm looks so delish! :) I'll have to try it out! This sounds amaaaaaazing! I just had balsamic in a dessert for the first time this past March (lame it took me so long to try that combination, I know) and it was just fantastic. Pairing it with strawberries sounds absolutely delicious. And as always, your photos are completely gorg. I'll pass along this recipe to my mum; as an alternative to her strawberries pie. I bet she's going to love it! Just beautiful - love the depth of whole grain crust. Thank you! I had one question: should I be taking the strawberries out with a slotted spoon after they macerate and that's the "remaining balsamic and honey" ...was just wondering how much of the liquid is actually put in with the strawberries! with this items many things can be made, So they are so interested to making his things immediately.And for this i really appreciate this things. Yes, the May weather has been treating us very kindly in Hollywood as well. And that galette looks so good. Just fantastic pics! This is beautiful and perfectly encapsulates the spring season. thanks for sharing your wonderful recipes, and the very lovely photographs. They make my day. I chanced across your site when I was researching on recipes for the cooking blog I recently set up, and have been very inspired by this site. Thanks also for your pancake recipe! I have credited your recipe and also linked you in my blogroll. This is so scrumptious!! Wonderful recipe! I need to just move in with you. How am I supposed to eat my boring toast with pb& honey while looking at this?!! !So beautiful and yummy looking! strawberries + balsamic + black pepper = best friends. I love this and as always your photography is stunning. I don't know why I've never commented before - but I'm in Georgia as well. p.s. I think a measurement for the black pepper in the crust was left out. I'm assuming its 1/2 teaspoon? Great pictures. Came across your blog while looking for something else! Photos are beautiful. I love strawberries with balsamic and with black pepper. That sounds something to try this summer when the strawberries of my parents get ripe in the end of June. Thank you for the recipe. What a gorgeous galette. Galettes have been on my bucket list for a long time but I just haven't had a chance to make them yet. But after seeing this post, I definitely want to tackle them this weekend. Thanks for the inspiration! This sounds delicious and looks incredible! Just dropping by to thank you for blogging and sharing amazing photos. Love the recipe. Quick question though. It says to divide the dough into half before refrigerating. But when you flatten to make the galette are you layering the two halves? Or did I miss something? Oh i'd surely like that! This looks deliciously amazing. Mmmm. LOVING this recipe!! I'm also a Southern gal, from New Orleans but living in Argentina. So happy to stumble upon your site. The pictures.... wow! Hi! I just made this galette few weeks ago and posted about it on my blog. I absolutely loved it! You can check it out here. Thanks for a great recipe! Love that you did this in your cast iron pan, I will have to try that! This looks so good! Ohhh I wish it was still strawberry season. I'm definitely saving this until then. Affordability has always been a problem and purpose behind many dragging away from learning. Though, with online learning, persons can register for life experience degrees and gain quality learning at reasonable charges without any condition of loan or other options.